When the sun rises each day, it rises on the church of the Living God all across the globe. From the Andes to the Himalayas; from the continents of the world to the islands of the sea; from villages in Africa to the megacities of Asia, worship from the lips of God's people is rising continually to His throne in thousands of unique languages. This is the family of God, the Body of Christ, a chosen people, His bride that He loves. Popular culture may consider the Church irrelevant, but it is the greatest community on earth and the most potent force for good. Not only that, the intercession of the Church holds the balance of power in the world today. Despite its many sins and its unfaithfulness throughout the ages, our Lord has entrusted His Church to go into all the world to preach the gospel and make disciples. As we move closer to the day when the kingdoms of this world become the kingdom of our Lord, the Church still has a work to do. More workers need to be prayed into the harvest, missionaries need prayer to persevere. Nations gripped by religious deception need the Truth. As we work for our Lord, our gaze is ever towards heaven, longing for the day when we see Him face to face. "Eye has not seen, nor ear heard, nor have entered into the heart of man, the things which God has prepared for them that love Him." (1 Cor 2:9 NKJV) Without a doubt the best is yet to be! With our high calling, God wants us to put on the garments of praise and live righteously so as to be effective in prayer and service. 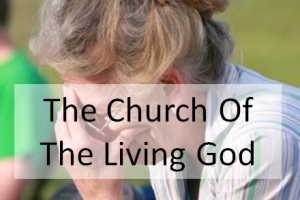 Sadly, the Church has befriended the world, allowing compromises and impurities to flood in leading many "astray from a sincere and pure devotion to Christ." (2 Cor 11:3 NIV) With repentant hearts let us call on God to revive and purge us so He can bring restoration and purity to His beloved bride.